MALDUR ATAI is a moon-shaped mechanical puzzle helping the monks to reach other dimensions in Nepalese temples in pre-Buddhist era. In these temples, the priest used to give a strange puzzle to his disciples. The disciples had to solve its riddle. By solving it the disciples were opening the hidden gate and withdrawing from the material labyrinth to the vision world. Only the re-encoded puzzle was found in the room of the mystic who had solved the riddle. The number of disciples was gradually diminishing until only one disciple who did not solve the riddle was left. The latter used to become the priest and teach a new generation of monks, giving the ordained disciples the mechanical puzzles to solve. In Buddhist era the concept of Maldur Atai means the location of substance. The last page of holy Buddhist scripts was always left empty (this practice was abandoned later). The Buddhists also called this page Maldur Atai. Having read the holy scripts a monk had to solve the puzzle of the last empty page and to reach final beatitude. In the monasteries in mountains, the monks used to find an empty cell with an opened empty last page of holy scripts. It was a common knowledge that the one who lived in the cell will never be seen again as he has withdrawn. The monks also told the legend saying that Maldur Atai cult will emerge before the apocalypse of the material world and the puzzle shaped as a young moon will stand as the symbol of this cult. In later treatises of the old scripts, the concept of Maldur Atai was interpreted in different ways, while its true meaning was usually distorted. 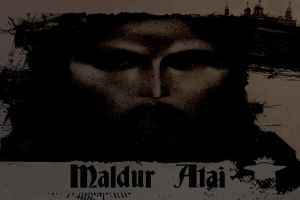 The monks’ rosary, pauses in mantras, secret cells of the monasteries and cult items were all called Maldur Atai. During the World War 2, the scientists of the Third Reich organised an expedition to Nepal. One of its purposes was to collect information about Maldur Atai, however, they failed to get any data on the arcane puzzle. Today, Maldur Atai concept is no longer used. However, the mystical object unexpectedly appears in pop culture. In the horror movie Hell Raiser, namely, Maldur Atai prototype is used for opening the gates to hell and invoking the killers. Today, when we witness the zenith of the materialistic world, the mechanical moon-shaped puzzle has acquired one more meaning. Maldur Atai is a new postindustrial musical project for exceptional sound travels to the forbidden world.